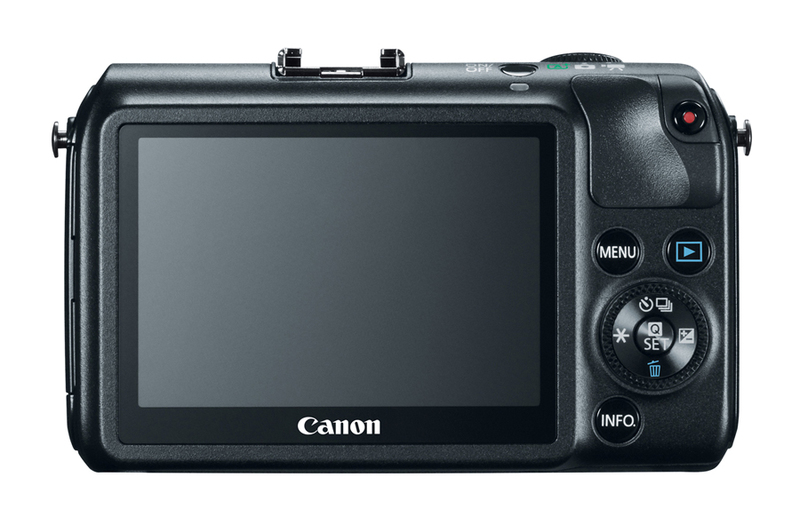 This week Canon announced its first mirrorless camera, the Canon EOS M.
Sadly, I’m underwhelmed. All I can do is sigh. It seems that Canon had a great opportunity to build the perfect storm of cameras: compact, mirrorless, interchangeable lens design (check), high quality sensor (check), electronic eye-level viewfinder (umm, oops!). Two out of three isn’t enough. Instead, I predict the EOS M will see an initial surge of excitement with an anticipated sales spike just before the holidays, and then most likely, a rapid loss of interest as the short-changed design becomes apparent through use, frustration and comparison (with envy) to other mirrorless camera models. Pretty much the same path as the Nikon1 cameras have done. – No eye-level viewfinder – the only way to point and shoot this camera is to hold it like a point and shoot camera – out in front of your face. This is not a stable way to hold a camera and is difficult to see the screen in bright outdoor light. This model does not even allow for an external electronic viewfinder to connect. I can’t imagine using this method to shoot an image with a large EF lens mounted on the little camera body. – Very few on-body controls. The mode control dial is gone, replaced with a point and shoot style dial with three choices: Green-Auto, Shooting mode, Video mode. A simplified user interface with very few on-body controls. This design clearly points to a certain market – someone who wants better image quality than a point/shoot or camera phone, without all the hassle of controlling the camera. At the announced price of $799 with a 22mm f/2 pancake lens, (non-stabilized lens, no included flash) I’m hoping buyers do some shopping around. There are plenty of comparable camera/lens deals that offer much more in the way of usability and features. I doubt many people will choose this model among a feature-rich selection in this price range. 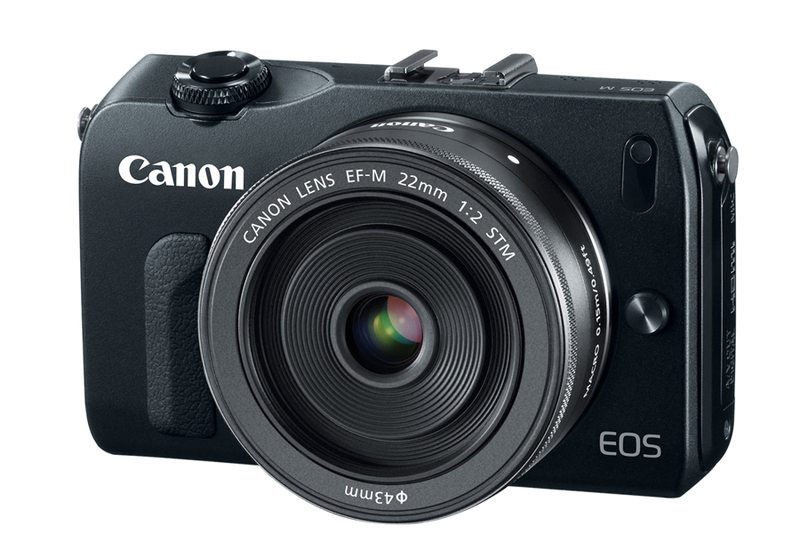 Several bloggers and commenters have suggested the EOS M is targeted at existing Canon DSLR owners who want a smaller camera. I find this an even less-likely market. I own several Canon DSLRs and if I want a smaller camera, I currently have two very useful choices: take a Canon Rebel (it’s small and light enough) or leave all the Canon stuff home and take a Panasonic M4/3 camera setup. Either of these options has plenty of advantages over the EOS M. The only advantage of the EOS M is its small size, but the lack of an eye-level viewfinder is a showstopper for me. Compared to a Panasonic G3, the EOS M is not much smaller. And for the record, neither of them are pocketable. The Canon EOS M next to a Panasonic G3 - neither of them are pocketable. I’m still hopeful that Canon will take an innovative leap and incorporate an electronic viewfinder (EVF) into their next Rebel DSLR model. This design would be the best of both worlds, as far as I’m concerned. The EVF, as part of a mirrorless design, would eliminate the moving parts associated with a mirror flopping around. It would also eliminate the focus variance between the focusing screen and the sensor. The EVF allows the photographer to immediately view a shot without moving the camera from their eye. In my case, this movement also involves putting on reading glasses, chimping, then removing the glasses to shoot the next image. The EVF image can be clearly viewed in bright sunlight. More conveniently, the user could make all menu changes at eye-level as well. And with all the rage about video, an eye-level EVF would be ideal, just like the video cameras of the good old days. Imagine, no need for a loupe to shoot video. I hope I’m wrong about my dismal prediction for this camera. It’s a selfish desire because if sales are strong, Canon will have the resources to get busy with the camera design I’m waiting for. Next postI took a knife to a gunfight…and lived.